Coming to this event, I was totally unprepared – under trained. During fasting month, I only did around 3 to 4 runs only of shorter distance. After fasting month (4 weeks to TMBT), I only did 2 long run lasting for about 4 to 5 hours. Other runs was shorter distance. My training mostly concentrated on uphill and downhill repetitions. Not much road running. From left – Zaeidi, Hamsul, Ahmad Fathi, Bahar and Hj Kamaruddin From left – Md Kairi, Ahmad Fathi, Pg Rosli and Hamsul. The race started before 7:30am, Saturday, 15th September 2012 at Kundasang Town, Sabah. It was a very cold, strong winds condition. I guess the temperature was around 22’C or lower, maybe. The start was somewhere in the valley. Due to strong winds, there was no start banner arch as it would be easily blown away. It was a mass start with the 25km, 50km and 100km runners start at the same time. Organizer didn’t waste any time by giving the first of many climb after the start. It was an easy short climb which later followed by a long run down the valley. Another long climb and another downhill run. A very good mountain view behind me. It was still cold and windy conditions. The photo above was taken at WP1 – 8:52am. At every water point (WP), we have to take our attendance with one of the marshals. One of the small stream crossing which was easy (3:44pm). There was around 12 water point (WP) and approximately 10km apart and some are nearer. The first 4 water point was easy because I still have the energy and mentally good. After WP4 – 38km mark which was another 12km to 50km half way point (resting point with refreshment provided), it was a torturing walk. WP4 was near the main road, so we thought, it will be a walk along the road to WP5, but it was just only around 1km ++ and then back to the village road of gravel road. The walk/climb to WP5 was around 3 to 4km. Zaeidi, Hj Kamaruddin and me was still together. Ahmad Fathi and MD Kairi was somewhere in front, maybe enjoying resting at 50km. Hamsul was somewhere further at the back. Finally reached WP6 – 50km mark, resting point where food was provided and we get to change and top up our supplies with our drop bag which we prepared earlier before the start. We saw Md Kairi and Pg Rosli there. Md Kairi decided to give up due to leg/foot pain while Pg Rosli decided to carried on. We decided to have our meals first. Bubur Nasi, Scramble eggs, vegetables, chicken, rice, hot and cold drinks. Excellent energy boost. After fully rested, Zaeidi and Hj Kamaruddin decided to carry on with the race. So I just follow lah. 7:30pm, we started our next 50km journey into the night. It was a dark moonless night and the flag marker was not easily spotted when in the dark. To reached WP7, it was an easy downhill walk along the gravel road before the long steep hill gravel road with jungles on both sides. Very scary man !!! It took us around 2:30 hours just to climb the hill. Another down hill before we reached WP7 and it was 10:58pm. Pg Rosli was resting and he said he decided to give up due to blisters. Zaeidi also decided to give up due to his leg pain was getting worst. I was ready to give up, so I rested for a while ( I guess 30 mins). Hj Kamaruddin decided to carried on with the race and since I don’t have any major problems with my body, just minor foot pain and blisters, I follow lah. WP8 was just 5km from WP7, so it wasn’t too difficult to reached. It was still a downhill and uphill climb before we could reached WP8. WP9 was 9km long and the most tiring of all. WP8 checkpoint was somewhere mid hill and from there we have to continue climbing until we reached an unfinished wide road in the middle of the jungle. All I can see was darkness and some houses lights not that far away. I saw a few moving white lights, I guessed it was from another runner. It was just me and Hj Kamaruddin and he was walking way infront of me and sometime I cannot see him after the corner. Luckily, he always wait for me when he knows that he is too far from me. I was too tired that I even closed my eyes and doze off for a few milliseconds – sleepwalking. I really hate this route, it was way damn too far. When we reached at WP9, it was already 4:49am, there were a few runners resting, so we decided to rest and wait for daylight before we continue with our journey. Since our location was somewhere in the mountain valley, it was cold, so I decided to use my emergency blanket (compulsory item) to warm me up. I’ve managed to sleep around 1 hour. Started the journey to WP10 just after 6am. It was still another downhill and uphill climb with a few flat route. It was not going to be easy. Reached WP10 around 8:10am, rested for a short while and continued our journey. WP11 was no different from other water station. UP and DOWN. To reached from WP11 to WP12 was a very challenging journey because I guessed it was around 10km apart and it was already mid morning – hot and sunny. Checking at WS12 and it was just 5km to the finishing point. The organizer is not going to make it easy for the last 5km. We have to go down steep hill along the vegetable farm and after that we have to go uphill to reached the open road highway. From there, I thought it will be just a short walk to the finishing line. hahahaha. It was the most painful walk that I have to take to reach the finishing line. From the main highway, we just need to walk a short distance before we turn right for another LONG down hill walk which was around 1km ++ to the finishing line. I came. I conquer and NOT really sure either to come back or not for 2013. My finisher medal 100km Ultra Trail Marathon. I just wished there was a finisher t-shirt, so that I can wear it and show it off that I’m the finisher of The Most Beautiful Thing (TMBT) 100km Ultra Trail Marathon. 112 finishers - 94 male finishers and 18 female finishers out of 140 paid participants. Overall rank – 108th out of 112 finishers. Summary from my Garmin 910XT which lasted for 31 hours without fail. Distance was more than 100km was due to at various Water Point (WP), I walked around, thus adding up the total distance (6km added). How did my Garmin Forerunner 910XT survive since its survival time is just 20 hours. I used Garmin Extended Battery Pack by Powermonkey. At every WP, I recharged my Garmin and I also used it to recharge my mobile phone. The external battery can also be recharge using solar power which I did . In overall, the organizer did a VERY VERY good job in making sure that the race wouldn’t just be a walk in the park. According to their statement, the route is equivalent to climbing Mount Kinabalu 2X. This is my second Ultramarathon. The first was Singapore Sundown 84km (2008). I came back 2010 trying to improve my 84km time but only managed to do 42km. 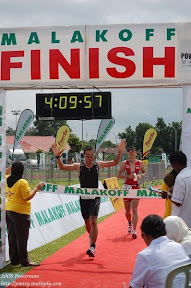 Hj Kamaruddin did his Sundown 84km in 2009 and Ahmad Fathi did his Sundown 100km in 2011. My backpack weighted more than 4kg and luckily I reduce the number of endurance gel that I carried. For 100km, I consume 2 packets of 2nd Surge, 2 packets of GU Chomp, 2 Powerbar Chocolate Bar, 2 Powerbar Triple Treat, 3 Bottles of Accelerade and unlimited water. Since I was doing more walking than running, so I consume less gels. Along the route, if there was a shop, we always buy something like cold Cola Cola, 100+, ice cream and at one time between WS10 and WS11, we stop at one of the restaurant and order some fried mee and fried rice. At one time also, my body rejected 100+, it taste different, so I just threw it away. A very good experienced for me and this time my body recovered quicker compared to Sundown 84km. The true challenge is not to give up - but to complete.